2. a S in T S ? 4. as E as ??? 3. to G B to S ? I haven't figured out all three of the SSD=21 ones. The first is clearly the number of pips on a six-sided die or a single standard die. The second is presumably something like the number of dominoes in a standard set of dominoes except that that requires an extra "of" which I'm assured isn't needed. And I don't know what the third one is, though I expect that like the other two it's a game-like thing and derived from 1+2+3+4+5+6. 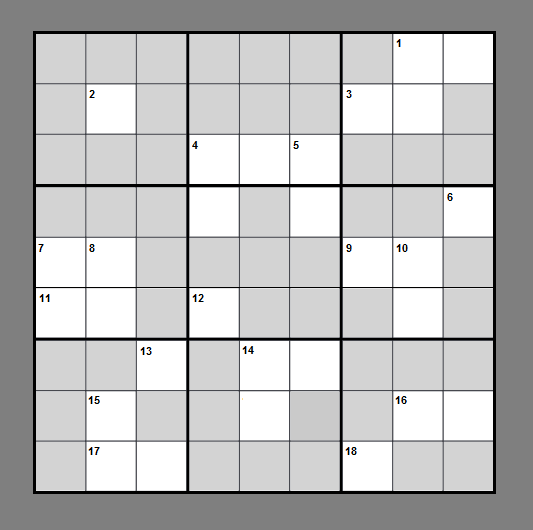 What is the fewest number of clues on a rotationally symmetrical sudoku grid with a unique solution? How do I necessitate the use of the X-Wing pattern during Sudoku creation?